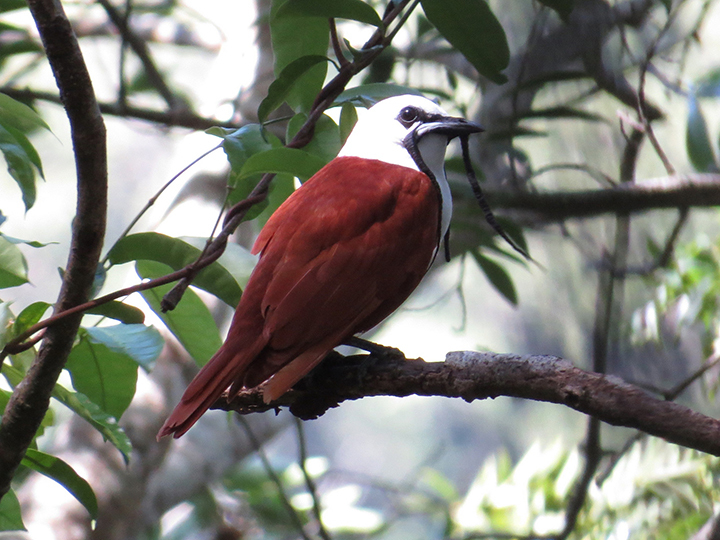 Male Three-wattled Bellbird (photo by Michael Loukides) released under a CC-NC-SA licence. I just received in an email a press release for the Zoo Conservation Outreach Group describing recent successes in fieldwork on Three-wattled Bellbirds (Procnias tricarunculatus) in Honduras. 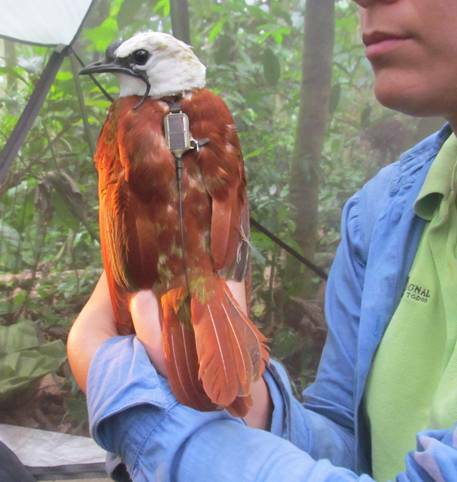 This project aims to use satellite tags to study the migratory movements of these endangered frugivores in the Sierra de Agalta cloud forests of Honduras. I have no doubt that Isidro Zuniga, our Honduran colleague during our last field season in Honduras was greatly involved in this research. The big mystery surrounding these odd birds (Family Cotingidae) is their complex migratory movements between cloud forests in the region. Each of these cloud forests is like an individual island of habitat in a great sea of lower level pine forests and agriculturally-dominated valleys. The birds are very evident from July to September in the Sierra de Agalta cloud forest, but then disappear for the balance of the year. 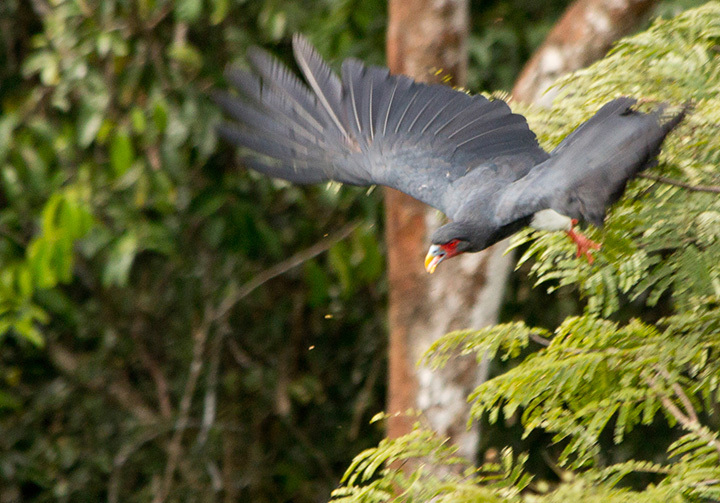 The team on the ground in Honduras, led by Dr. Robin Bjork, has managed to outfit four of these birds with satellite tags which are transmitting data already. The data generated by these tagged birds should be very interesting to say the least, and will help identify key habitat for conservation efforts. A bird in the hand is worth quite a bit! 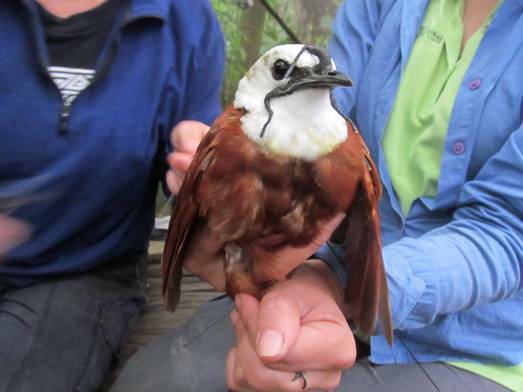 Male Three-wattled Bellbird outfitted with 5 g satellite tag. This entry was posted on October 19, 2014, in Natural History, Research and tagged Bellbird, Conservation, Honduras, research. I am always a fan of raptors, and have a special place in my heart for social and predation behaviour. Here is a story that combines all three! In the latest issue of Journal of Raptor Research, a remarkable observation of a large group of Golden Eagles harassing elk on a steep ridge is reported (but paywalled). Matt O’Connell and Michael Kochert witnessed and filmed the astonishing sight of at least 8 eagles repeatedly stooping at a group of elk, either trying to drive them off a cliff, or perhaps just playing around. Golden Eagles are known to prey on ungulates, sometimes by driving them off cliffs, but the authors are cautious at definitively stating the motivation of these birds. I would suggest that the hypothesis of play and that of predation are not mutually exclusive. I could certainly see a great selective advantage for these carnivorous birds to engage in “play” that sometimes results in the grisly death of a large ungulate. If you would like to see the video, here it is below. What do you think? Bergo, G. 1987. Eagles as predators on livestock and deer. Fauna Norvegica Series C, Cinclus10:95–102. Deblinger, R.D. and A.W. Alldredge. 1996. Golden Eagle predation on pronghorns in Wyoming’s Great Divide Basin. Journal of Raptor Research 30:157–159. Erwins, P.J. 1987. Golden Eagles attacking deer and sheep. Scottish Birds 14:209–210. Zettergreen, B. 2006. Golden Eagle attacks and kills yearling mountain goat. Wildlife Afield3:27–28.